We know that there are unprofessional roofing contractors in the Coachella Valley, and they make our industry look bad. There is no room for low-quality work in a rapidly growing area that prides itself on beautiful landscapes and quality roofing services. The owner of Reliable Roofing has over 25 years of experience driving sales while maintaining financial and operational responsibility in the industry. The company boasts unparalleled experience in producing quality work while hiring and training a strong office and field staff. We help homeowners in Indio add to the long-term value of their homes. Choose a company that delivers solutions for good. Reliable Roofing technical services can find a solution for any type of roofing issue. Contact us today to schedule an inspection. Reliable Roofing employs qualified crew members who understand the business inside and out. Our office staff can answer your roofing questions and make sure your needs are being met while walking you through price estimates and what to expect once we arrive at your home or business. A roofing contractor should always offer quality service and professionalism. But after the job is done, how was the overall experience? Maybe the work is complete, but did the crew leave a mess of supplies and old materials in the yard? Did the phone representative offer relevant information? Were they transparent about the pricing and payment processes? Poorly-mannered workers are a common and unfortunate sight, especially with the increased number of construction projects popping up around town. But roof construction should not be taken lightly. Our customers know that we only employ a professional and approachable crew; doing the job right while bearing in mind the significance of the work being performed. Our company offers competitive prices on roofing services. Our communication is clear and thorough so no questions are left unanswered. We offer a full range of services from leak repair and proactive maintenance to gutter and steep slope roofing options. Don’t try your luck with an uncertified roofing company with no credentials or positive customer reviews. We’ve heard the horror stories about roofers who disappear before finishing a job or use poor quality materials only to have to return a year later to repair their own shoddy work. 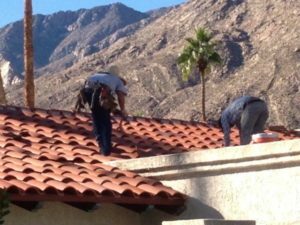 What makes us stand apart from other roofing companies in Indio? Reliable Roofing Looks forward to keeping your home safe and comfortable year-round! Give us a call today.